I've finally got this figure finished after she's been sitting on my shelf for months. She's sculpted from Fimo and Milliput and unposed would measure about 33mm tall. It took a while, due to that nature of the pose and simply being able to reach certain parts but I'm really happy with how she turned out. I really tried to push myself with this one and create something dynamic and interesting, whilst still being relatively simple for the customer to assemble. It will hopefully be a 3 part figure (body, left arm, base piece) so there won't be any pinning of spindly arms required! 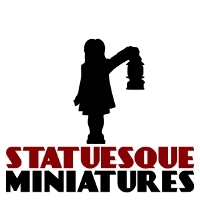 She'll be available from Statuesque Miniatures soon!